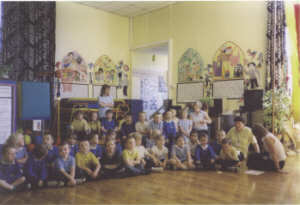 The children of Parkside Infant School welcomed local singers and their band to the school during May 2004. These were the first sessions where the were introduced to mining songs and poetry which would be used to entertain guests at the Official Launch of the Seaham Mining Heritage project on May 18th 2004. 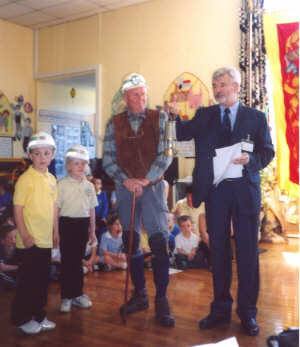 The SDVT Mining Heritage Project was officially launched on Tuesday, 18th May 2004 at Parkside Infant School. SDVT Chairman , Dr Eddie Mason, welcomed the guests, thanked the children for being present and explained why this project is so important to the community of Seaham and the surrounding area. The project was then officially launched by two of the children accompanied by Miner Tom. Miner Tom helped the children to ignite a miners lamp. Symbolically, the lighting of the lamp represented the shedding of new light on the rich mining heritage of Seaham. Then, like an Olympic torch the lamp was passed from speaker to speaker as the special guests and Elizabeth Harwood the Head Teacher spoke of their hopes and good wishes for the success of the project. Then the children entertained the guests by singing mining songs and reciting mining poetry that they had learned in the short time since the project had been given permission to start. The audience were well impressed. A number of other photographs taken at the launch can be accessed below.